The Regional Universities Forum for Capacity Building in Agriculture (RUFORUM) is a consortium of 66 universities in 26 countries in Africa whose mission is to strengthen the capacities of universities to foster innovations responsive to demands of small-holder farmers and value chains through the training of high quality researchers, the output of impact oriented research and the maintenance of collaborative working relations among researchers, farmers, national agricultural research institutions and governments. 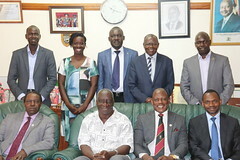 RUFORUM envisions African universities fully integrated and contributing to national development goals. RUFORUM’s work contributes directly to the Comprehensive African Agricultural Development Program (CAADP) and the Science, Technology and Innovation Strategy for Africa (STISA, 2024) of the African Union that highlight the importance of agriculture and STI as a means of stimulating economic development and eradicating poverty on the continent. They also emphasize the need for and importance of high level capacity, particularly postgraduate level training and research including the escalation of PhD training in Africa to which RUFORUM responds. RUFORUM is seeking for a well-qualified and motivated candidate to fill the position of Manager, Information & Technology (IT) at its Secretariat based at Makerere University Main Campus, Kampala, Uganda. Candidates from outside Uganda are especially encouraged to apply. Click here for more details.